This In An Adorably Accurate Statue Of A Scottish Terrier. Brave And Alert, The Scottie Is Hardy And Lovable. They Are Charming And Full Of Character. Playful And Friendly As A Puppy, He Matures Into A Dignified Adult. It Has A Long Coat That Reaches The Floor, Each Hair Is Distinguished From The Next Giving The Appearance Of A Real Dogs Hair And A Nice Thick Coat. His Bushy Eyes Brows Almost Cover His Eyes, But In The Right Angle You Can See The Detail A Beauty In Them. Two Curtains Of Hair Part At His Nose, Exposing His Mouth And Snout. The Painted Detail Is What Really Makes This Look Like A Real Dog As It Has A Two Tone Patina. 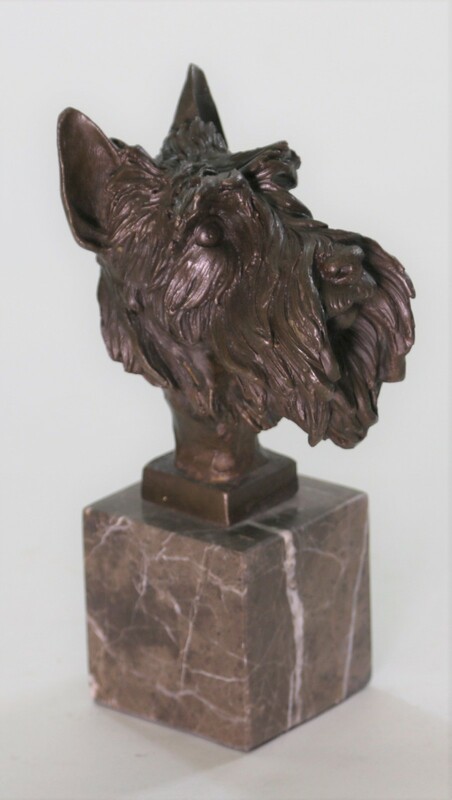 He Is Handmade Of 100% Bronze And Cast Using The “Lost Wax Method” And Is Signed By Artist.